The songs come around the corners at Polk County Middle School well before the tie and tennis shoes. The tunes could be anything – rock standards, ballads, country classics. But they come, always, a sign that Hank Utz is soon to follow. “He sings, all the time,” said Polk County Middle teacher Kim McMinn. “In the office. In the cafeteria. Going down the hall. Every genre of song you can think of, and it keeps us laughing. That so many know the music, know the trademark tie-and-tennis-shoes look that Utz often sports, signals another type of value – a principal who isn’t mired eight hours a day in his office. Utz is always on the go, in the halls, a visible presence by design rather than necessity. Soon, though, Utz’s example, not to mention his melodies, will no longer echo through the halls of PCMS. When Friday’s end-of-year awards day ceremonies conclude, Utz will send students off to summer vacation for the final time, his retirement later this summer a step closer to reality. And a day closer to a farewell to the only principal Polk County Middle School has ever known. The kids. It is always about the kids. It’s been that way for the nearly four decades tht Utz has been a school administrator, a principal at schools in Florida and North Carolina. Small schools. Larger schools. Rural. Urban. The challenges changed with each; the desire to place students first has never wavered. “I’ve been in a lot of different settings,” Utz said. “I’ve been in administration since I was 29. which is rare in itself. I’ve gone from being principal of a small little Catholic school to the middle of Orlando, Orange County, where the schools were 1200 students and a lot of different mix there. Then making the transition from Florida to North Carolina, it’s totally different from downtown Orlando to Flat Rock, where I first started. Handling those challenges has been made easier, in part, because of his approach to leadership. Utz has always set high standards for himself and, by extension, the students he serves. Be it in the classroom, band room, art room or athletic fields, Utz has always expected every student to be proper representatives of the schools. 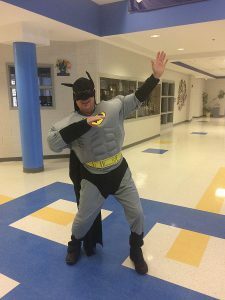 Polk County Middle School principal Hank Utz donned a Batman costume during PCMS Take A Stand dress up day. It hasn’t been uncommon to see Utz, who also has served as Polk County Middle’s athletic director, at sporting events rooting as hard as he could for the Wolverines, but doing so in a manner consistent with the image he wanted Polk County Middle to portray – and expecting the same from faculty and students. “I really believe in everyone hearing the same message,” Utz said. “Number one, I hold high expectations for myself. I’m my toughest critic, and if something goes wrong, I look at what could I have done and what should I have done there. 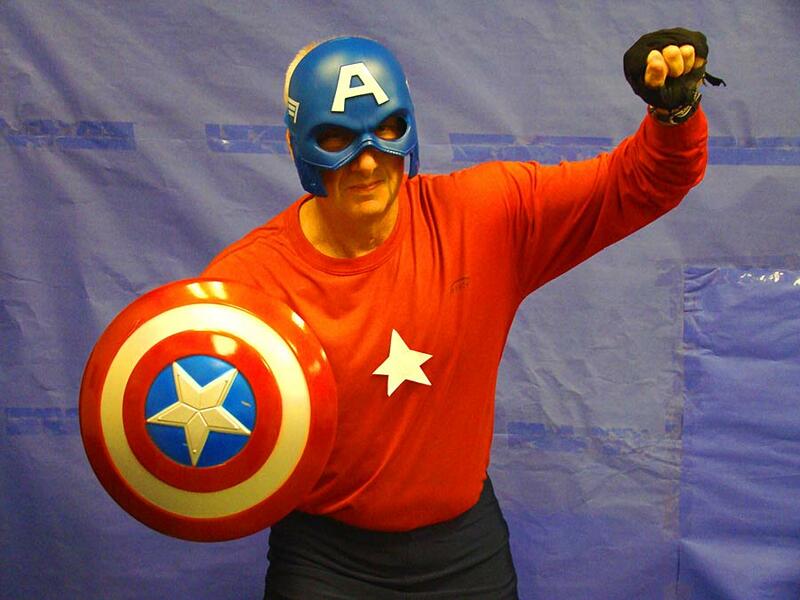 Those standards have also endeared him to the PCMS faculty. “Mr. Utz has devoted his life to providing a safe place for children to learn, grow and be the best person they can be,” said Accelarated English Language Arts teacher Jeanne Ferran. “While academics are important, Mr. Utz believes in educating the whole child. He believes that every child has talents, gifts and abilities, and our job as teachers is to provide the best opportunities for them to thrive. 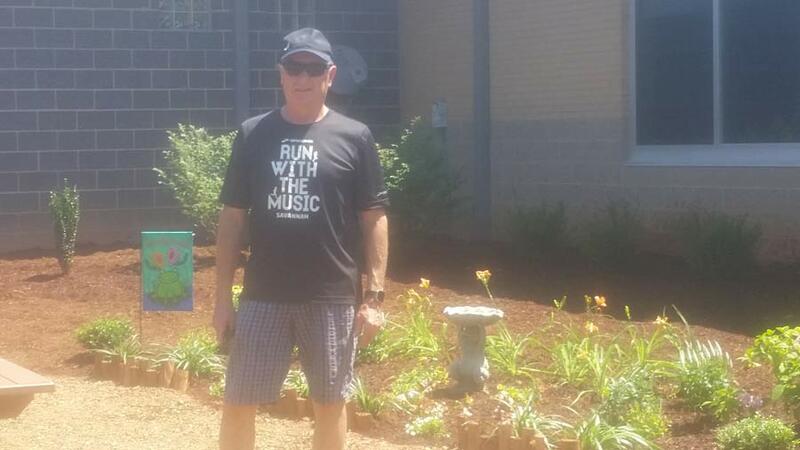 “I believe Mr.Utz is the epitome of a great principal with many strengths, but the the one that comes to mind first is his compassion,” McMinn said. “He is a compassionate man who cares deeply about his staff and his students. He wants to know all of us and support all of us in all that we strive to achieve. A man who dislikes the spotlight would shudder at the notion, but it’s only mild hyperbole to think of Polk County Middle School as The House That Hank Built. At the very least, his name will forever be part of the school – Polk County Schools announced Thursday that the athletic complex at the rear of the campus will be known going forward as William Hank Utz Jr. Field, a sign added to the scoreboard there to reflect such. It’s a testament to the legacy that Utz has built in his 13 years at Polk County Middle, there since he opened the doors to students on an August day in 2005, rocky beginning and all. “A lot of people coming in to Polk County don’t realize that the consolidation to one middle school was not looked on favorably by everybody,” said Utz, who moved from the principal’s post at Tryon Middle School when that school merged with Saluda and Polk Central middle schools. “There was a lot of concern about that. The school did open on time, and Utz, Johnson and Gregory shephered students from the three schools into a single, cohesive student body. From day one, though, the school has been an extension of Utz’s philosophies, the student-first but not student-run approach helping form Polk County Middle into one of the state’s top campuses. “The vision that I’ve had for the school is always that it’s not an us-against-them type of mentality,” Utz said. “With everybody working together, parents, students and staff, you can achieve a quality school. No one appreciates the Utz approach more than Polk County Schools Superintendent Aaron Greene. “Hank Utz has dedicated more than a decade of his life to making Polk County Middle School one of the best schools in North Carolina and perhaps the country,” Greene said. “Mr. Utz is the only principal that Polk Middle has ever known. He opened the doors, set up the schedules and programs, nurtured and supported his staff and ensured daily that the young people he served had the foundation and resources they needed to reach incredible heights. He established the culture, led PCMS to high achievement and provided life-changing experiences for our kids. Utz feels the same way about his time in Polk County Schools. “I really would like to thank the superintendents, the Board of Education, for allowing me to do what I’ve done here,” he said. “I think it is unique to have one principal in one spot for 13 years. It’s a great place to work, and really we couldn’t have the success we have at Polk County Middle School with the support of the community, the Board of Education, the superintendent, parents, staff. PCMS principal Hank Utz talks to parents about the start of a school year and the goals and vision for the rest of the year. Retirement may be at hand, but Utz has steadily declined to think about it. He has focused on the routine – end-of-year testing, preparing for the final days, the traditional last-day awards ceremony. He has not indulged in any second-guessing his decision. That someone will be Todd Murphy, a former Utz assistant who will move from Tryon Elementary this summer. Polk County Middle will become his ship to steer, and Utz will head off not to greener pastures, almost. “I have a pretty big yard, and I do what my wife tells me to do,” Utz said. “We have a bunch of different gardens, and I could literally work in the yard four or five hours a day. And those grandchildren will serve as a proxy for that which he’ll miss most about education. “That’s an easy one. I’ll miss the kids,” he said. “I really enjoy middle school kids. I really fell into it. It wasn’t like, gee, I want to be a middle school teacher and gee, I want to be a middle school principal. It’s sort of what opened up for me originally.